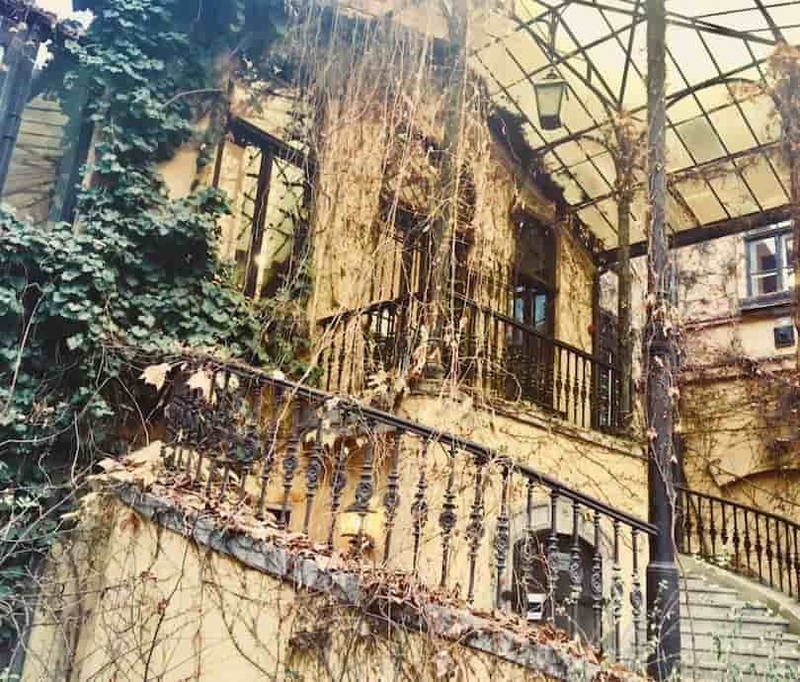 Want to know the coolest neighbourhoods of Budapest? Discover with us the most exciting areas of the city, avoid the tourist traps, and learn everything about what to see, where to eat and where to sip your coffee at a particular spot. Live here like a local. 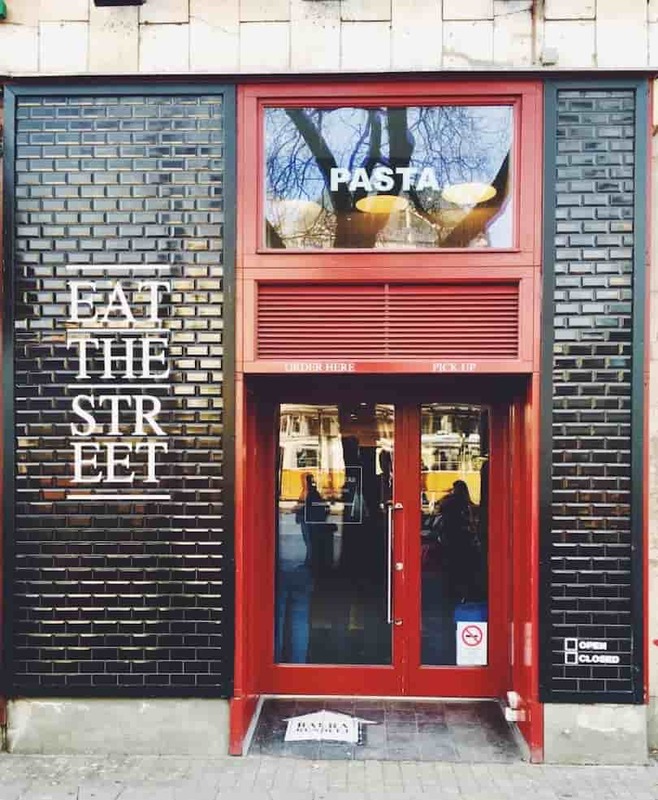 Want to know the coolest neighbourhoods of Budapest? Our brand-new guest blogger Juli from Catch Budapest will introduce you to the best places to discover. She gives you the best insider tips in Budapest. Discover the most exciting areas of the city, avoid the tourist traps, and learn everything about what to see, where to eat and where to sip your coffee at a particular spot. 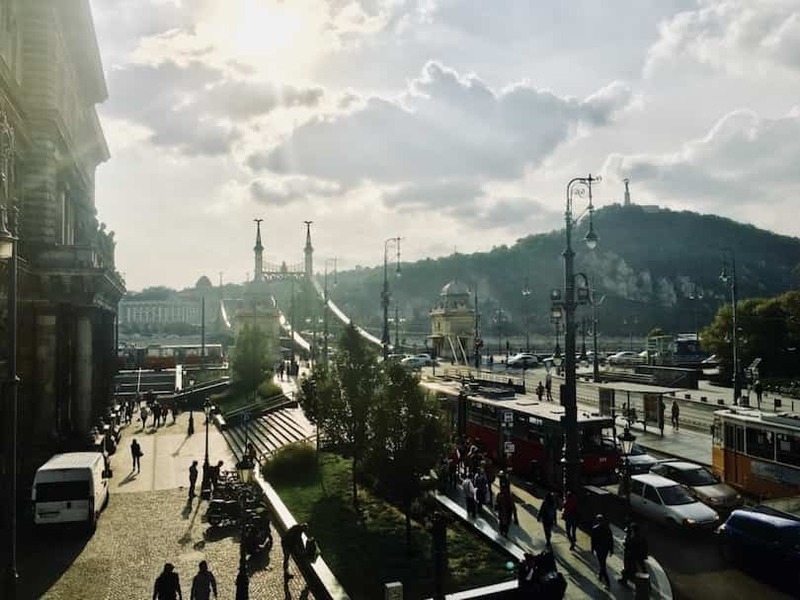 Know your Budapest, and get below the surface, bit by bit. Budapest has so many körúts (“ring roads”) that it’s easy to get confused. Every körút definitely has its own strengths and curiosities. Károly körút is the gateway to nightlife, while Margit körút has Bauhaus architecture and is the door to Margaret Island. So what is Vámház körút famous for? In short: its urban life and beauty. There is so much to see and do in this tiny area that you can literally spend hours or even a whole day here without getting bored. Vámház körút is the heart of and gate to Budapest. Vámház körút is the part of the small ring road which runs between Kálvin Tér and Fővám tér. It’s just one single tram stop and a five-minute walk in total, but trust us: this short street is a true ripsnorter! Take trams 2, 47 or 49, the M2 or M4, or any one of a number of buses, and all will stop at either Kálvin tér, Fővám tér or both. Stand at Fővám tér and marvel at the blazing green colours of Liberty Bridge – at day and at night time. Visit the beautiful Szabó Ervin Library and get the feel of being in a 19th century palace. 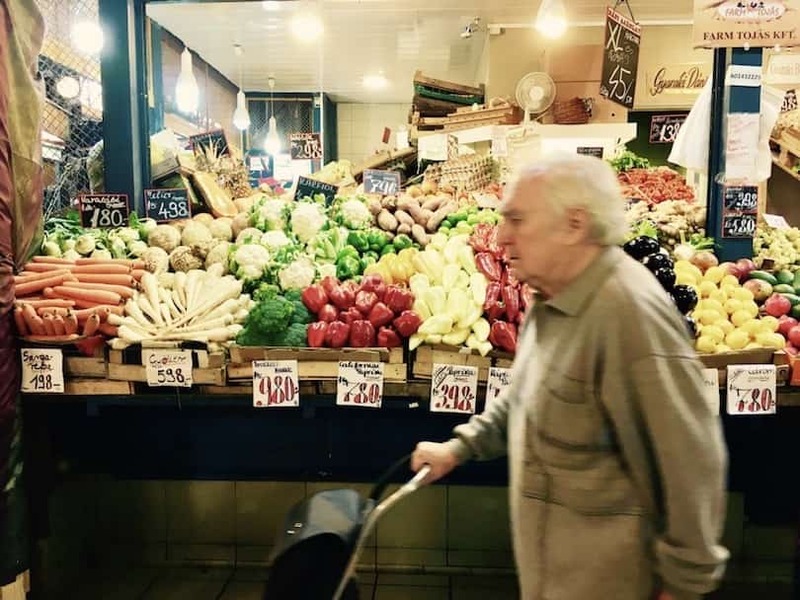 Give in to the lure of the Market Hall and stuff yourself with rétes and retro coffee. The view from Fővám Tér – Most of the actual “sights” of the Vámház körút area are all conveniently concentrated right at Fővám tér. 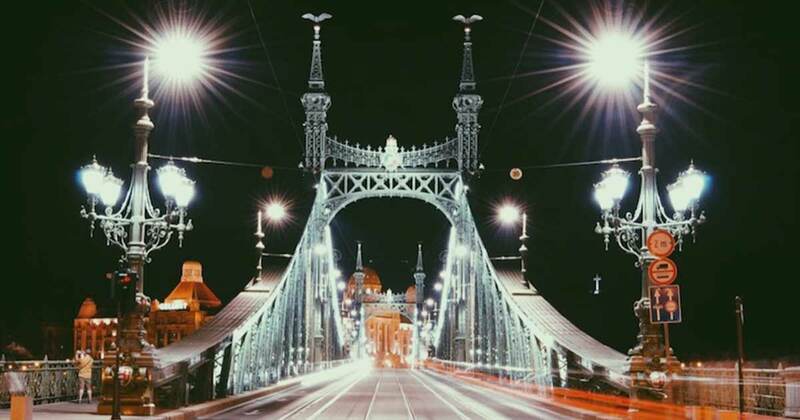 Admire the beautiful Liberty Bridge (Szabadság híd) and its shiny green colour. See the neo-renaissance building of Corvinus University right at the bridgehead, or look across the water and admire the Budapest University of Technology on the opposite side, as it stretches down the Danube bank. On the opposite side of the ring road you’ll see the entrance to the shopping heaven of Váci utca. With its hordes of tourists, souvenir shops and overpriced restaurants it’s definitely a street to either love or loath. But either way, it’s an inherent part of Budapest that’s not about to take a different track any time soon. Liberty Bridge deserves an extra mention here, and not only because of its shiny green colour. What’s truly amazing about it is that you can actually sit on it and gaze at Budapest’s beautiful sights all the way down the Danube. A truly unique experience! The Great Market Hall (Vásárcsarnok) was Budapest’s first market hall and is definitely the most well-known. 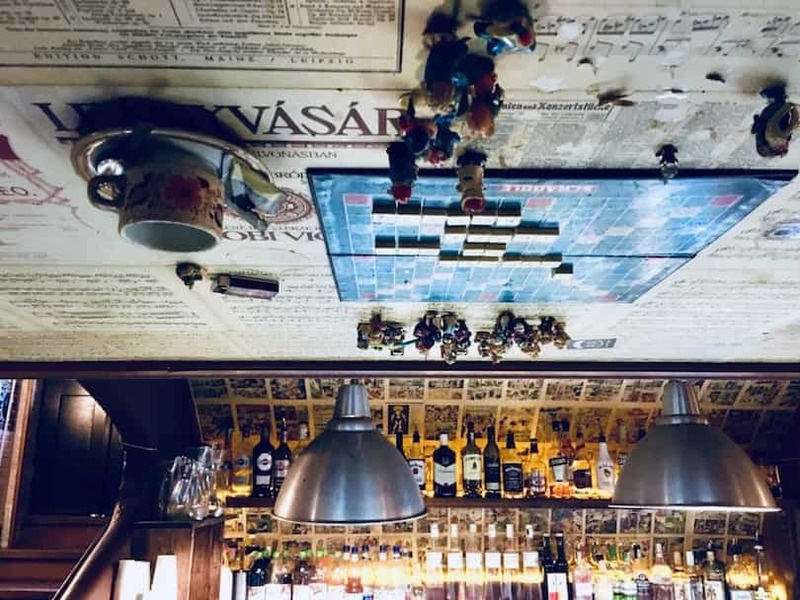 If you ask Hungarians about the Vásárcsarnok, you might get some rolling eyes and they will tell you it’s waaay too touristy, crowded and overpriced. We partially agree, but while there are many other awesome markets in Budapest, our love for the Vásárcsarnok outweighs the few annoyances. The Grand Market Hall is simply a place you have to approach the right way, and it’ll give you a great experience, fresh goods and make you come back for more, again and again. Csarnok Square – Most people enter the Market Hall right from Fővám tér. We usually take the back doors and enter and exit from Csarnok Square, which is at the back of the hall. It’s a lot less hectic than Fővám tér itself, and a great place to linger for a while. This is true especially on sunny days when you can sit outside. 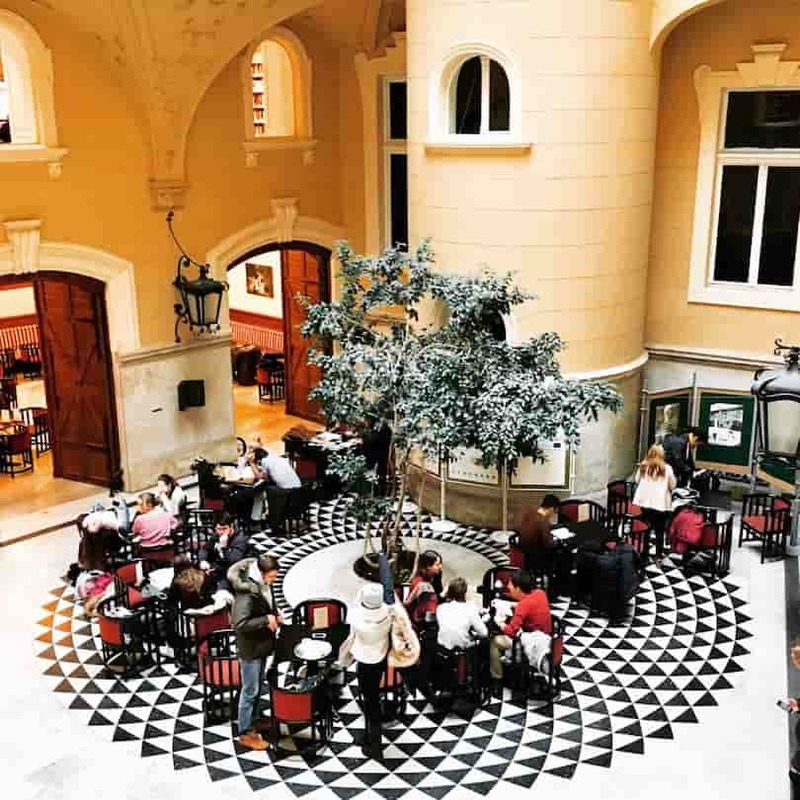 Csarnok tér is also our favourite place to munch our rétes and sip our retro coffee. 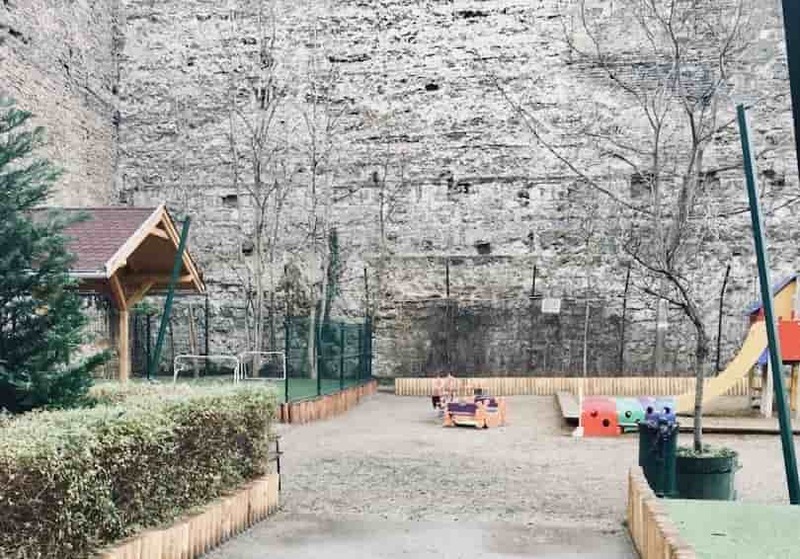 Now let’s get completely away from the touristy stuff to see a really cool little secret right in the heart of Budapest. The Kiskörút (“Little ring road”) didn’t get its name simply for fun. It was actually the former border of the city of Pest, and thus the place where the old city walls stood. The good news is that, although only in part and quite hidden, they still are there. And waiting for you to see them! One part is located in Királyi Pál street. You’ll find a small glass door on the left right after Manna ABC. To get inside, just cross the street and ask for the key at the Imagine Budapest Office at Királyi Pál utca 18. 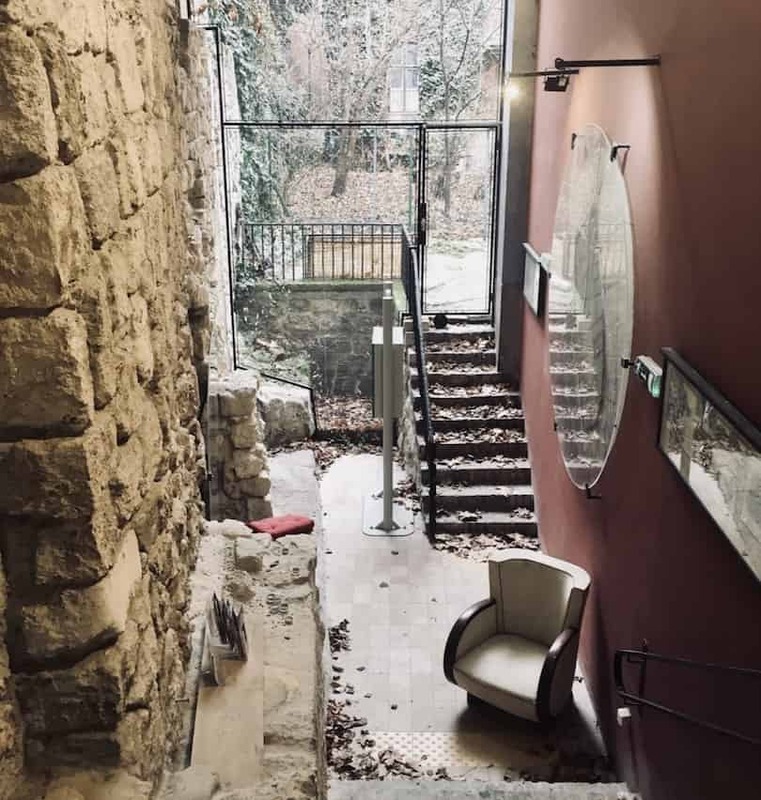 The glass door opens to a little secret hideaway, where you’ll be tucked between the city walls and old photos of Budapest. There is also a huge map where you’ll see the course of the former wall. A truly amazing place! But there’s also another place to gaze at these former protective borders of the city. Just walk a few metres further down on Királyi Pál utca and turn left into Bástya utca. On your left side, you’ll see the playground of a kindergarten and a parking area. And a building behind that. A building which was actually built ON the former walls. We love how seemingly dull constructions and buildings we pass every day suddenly start telling a story and become interesting places full of history. These old walls are a prime example of that. Definitely worth checking out once you’re in the Vámház körút area! 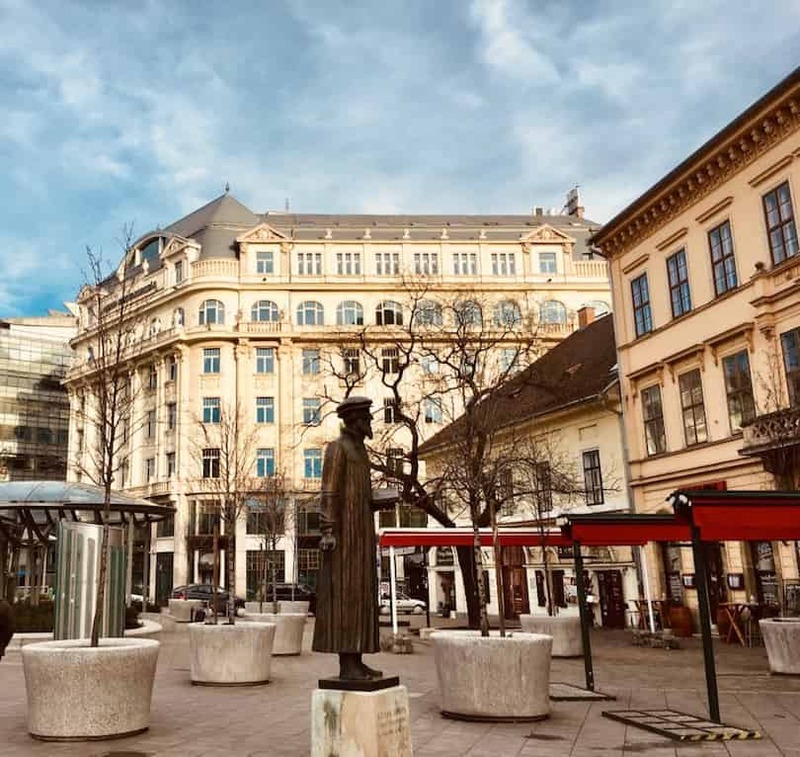 Kálvin tér is named after protestant reformer John Calvin and his statue right in the middle has been gazing at the everyday hustle and bustle on this lively square for years. 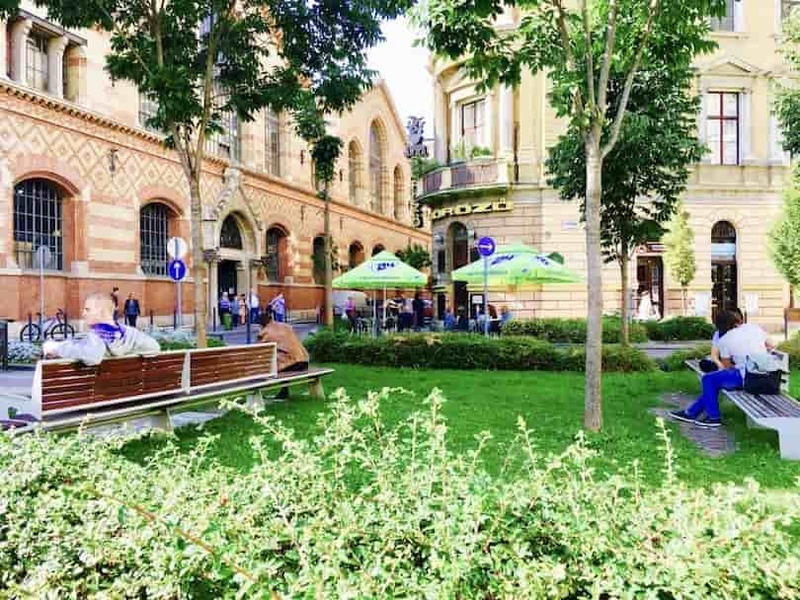 Although really busy, Kálvin tér is still a really pleasant square, especially in sunny weather when the terraces of the surrounding bars and restaurants are open. A little bookworm paradise well worth seeing is the Szabó Ervin Library right behind Kálvin tér. Many of Budapest’s libraries are simply beautiful pieces of baroque architecture, and Szabó Ervin is a showcase example of that. Visit the reading rooms in the back of the fourth floor. What awaits you are the most amazing, shiny rooms of this former palace. 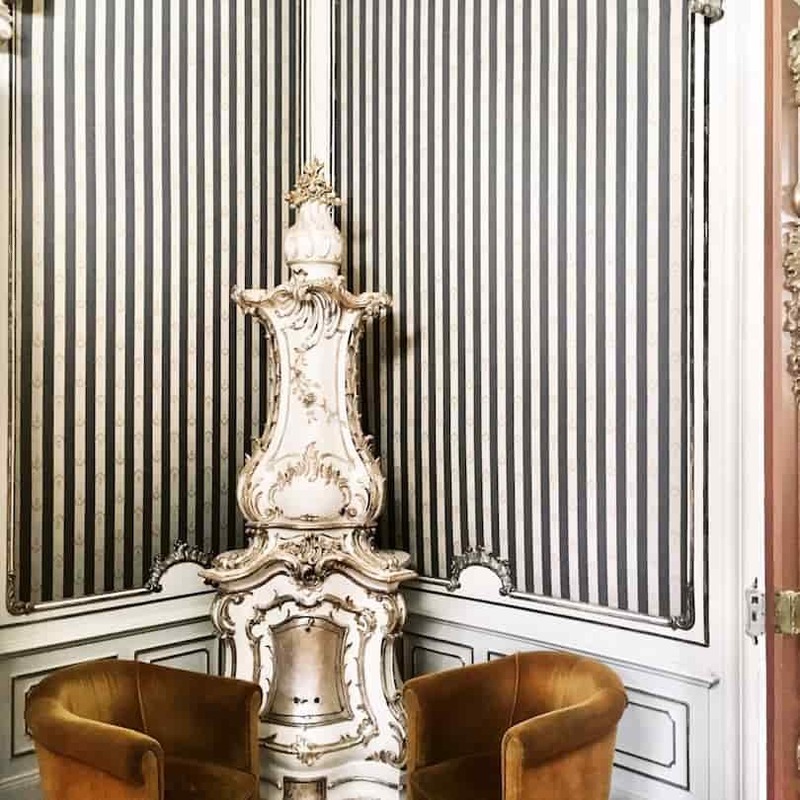 This is the place to experience a little time-travel back to the era of chandeliers and ostentatious interior design. Once you’re in the Szabó Ervin area, don’t forget to walk down or marvel at this part of Baross Street. 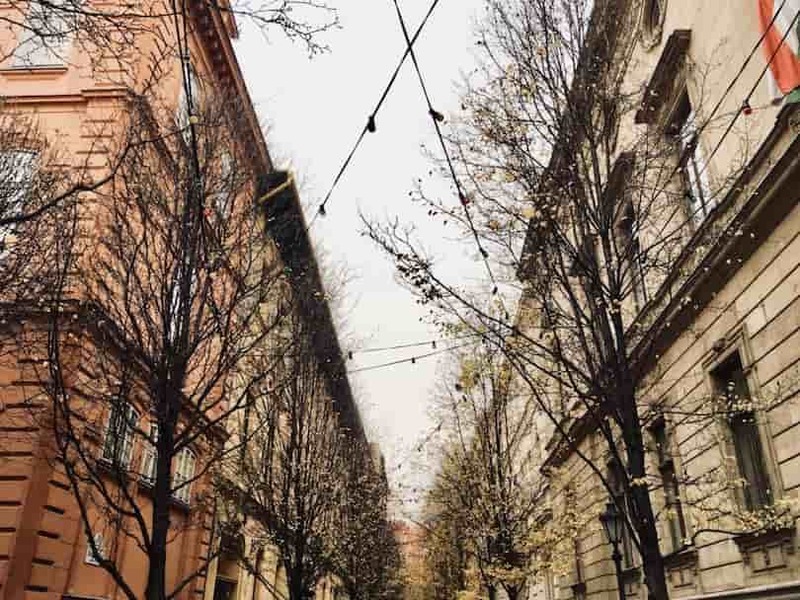 With the surrounding trees and the cobblestones, we find this one of the most romantic areas of Budapest. During summer there are even little lightbulbs hanging on the street, which make this little hideout even more enchanting. We’re right in the city centre, which means an abundance of good food, drinks and choice, ranging from Hungarian to amazing international options. The trick is to separate the wheat from the chaff, and not fall into the tourist traps, which obviously go hand in hand with a location like this. Although you’d think that the Grand Market Hall is the most obvious option to look for some great bites, it’s actually the last place we would recommend for food. That’s the truly touristy and overpriced part of the Vásárcsarnok. But don’t fret – there are so many more culinary delights around the corner that you definitely won’t stay hungry in the area. 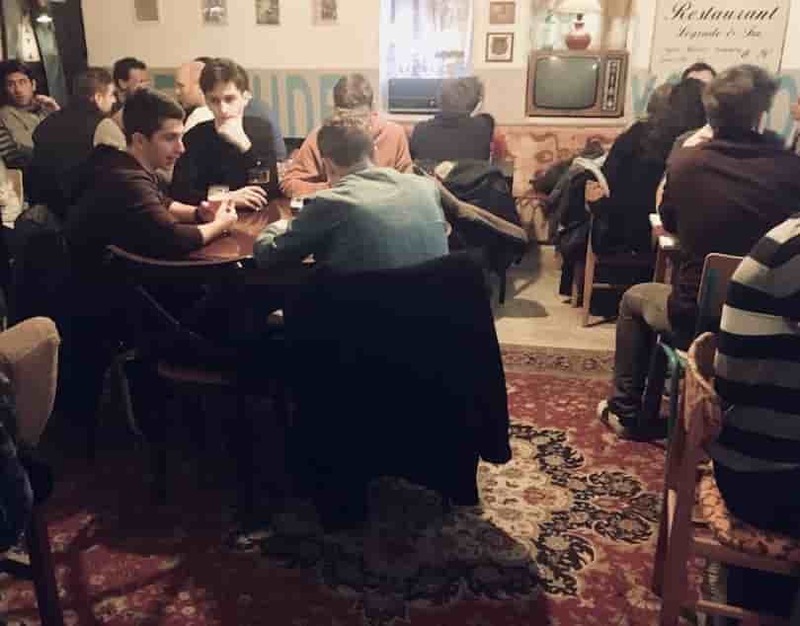 Trapéz Dive Bar – If you’re looking for a truly local and youthful atmosphere, head directly to Trapéz Dive Bar right behind the Market Hall, where the students of Corvinus University hang out on a daily basis to study and have cheap but tasty bites and drinks in a living room-like atmosphere. Café Mézes – Café Mézes is another very unpretentious place right at the side of the market hall, selling a range of very decently priced craft beers. Mélypont Presszó – If you’re after a little time-travel back to a living room of the 1970s, look no further than Mélypont Presszó. It’s hard to see the little black door leading to this old house’s basement, but once you’re inside you’ll feel right in the middle of your grandma’s socialist flat. The interior is just faultless, and so are the drinks and prices. They have a really wide selection of craft beers and this is definitely the place to try “macifröccs” (little bear spritzer), a fröccs vamped up with syrup and a gummy bear. Sounds a little weird, but it’s super sweet and colourful! Leves. & Pasta. – Vámház körút itself is also a stronghold of our favourite quality street food in Budapest – at least since Leves. and Pasta. set foot there. Leves. will completely spoil you in terms of soup. This dish is never going to be the same after you’ve tried one of their unique broths. Think unique combinations like pumpkin cream soup with coconut flakes or an Indonesian chicken soup. Pasta. on the other hand will sell you the best takeaway pasta there is. Go for the classic Bolognese or a more edgy choice (think tandoori-masala curry with coconut sauce) and indulge in a box of Italian-Hungarian fusion kitchen cuisine with the occasional Asian influence. Italian-Hungarian-Asian fusion streetfood heaven. What’s not to like? 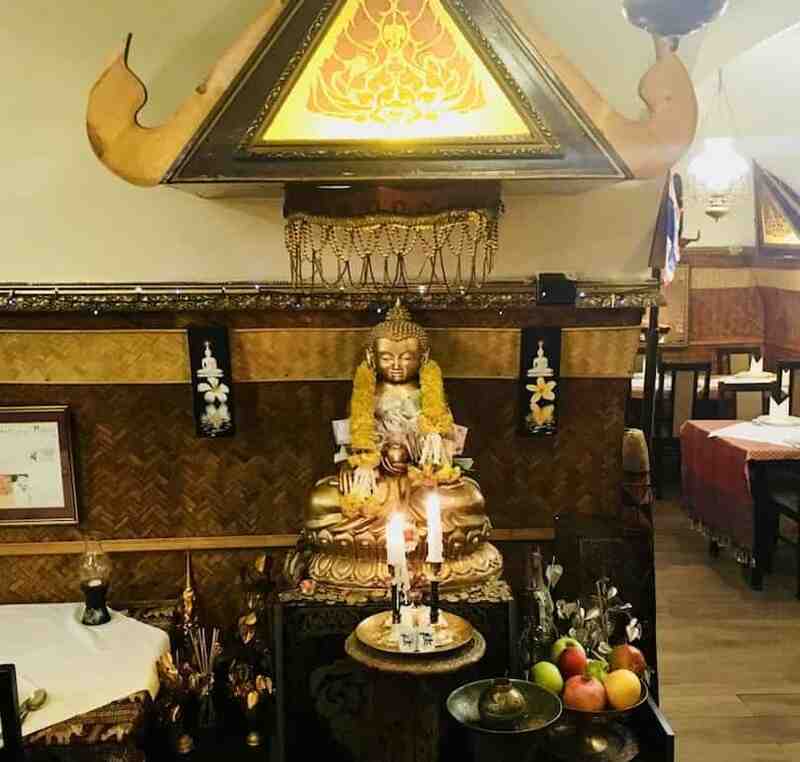 Bangkok Thai Restaurant – Apropos Asian – one of Budapest’s best Thai restaurants is actually hiding in a little street right behind Fővám tér. Bangkok has come to Budapest and it’s delicious! This place has nothing hip about it; instead, both the interior and deco are a full-on Asian sensory overload. Their lunch menu for 1,500 HUF is unbeatable in both price and taste. Café Intenzo & Calvin Bistro – For rather Hungarian lunches, both Café Intenzo and Calvin Bistro right on Kálvin Square are great options. Their daily menus are very fairly priced and tasty. Építészpince – Építészpince (“Architect’s Basement”) also has a menu that is hard to say no to. For only 1,150 HUF you get three courses of simple but really good and mostly local dishes. The place itself is also remarkable, since it is located in another former palace. The courtyard is a truly wild, romantic and very photogenic hangout. Pata Negra – Right next to Café Intenzo you’ll find Pata Negra, where you get the best Spanish tapas experience in town. For us it’s the perfect way to add variety to your meal. It simply means small but many and various portions of delicious foods. This tapería makes for a great dining experience that is a different and unique experience from what you’re used to. 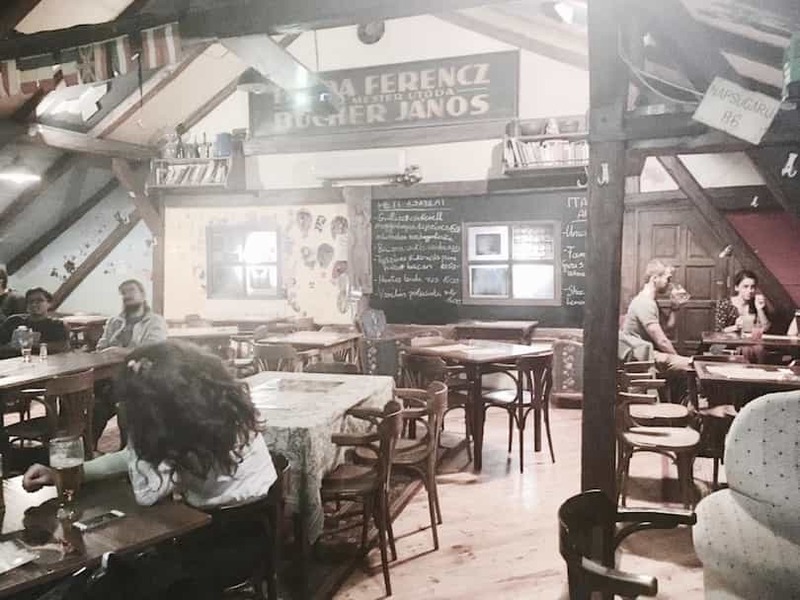 Fecske Presszó – If you’re craving a great, local and good-value goulash, lecsó (ratatouille) or sztrapacska (“ewe-cheese dumpling”), look no further than Fecske Presszó, another well-established institution and hangout among students. 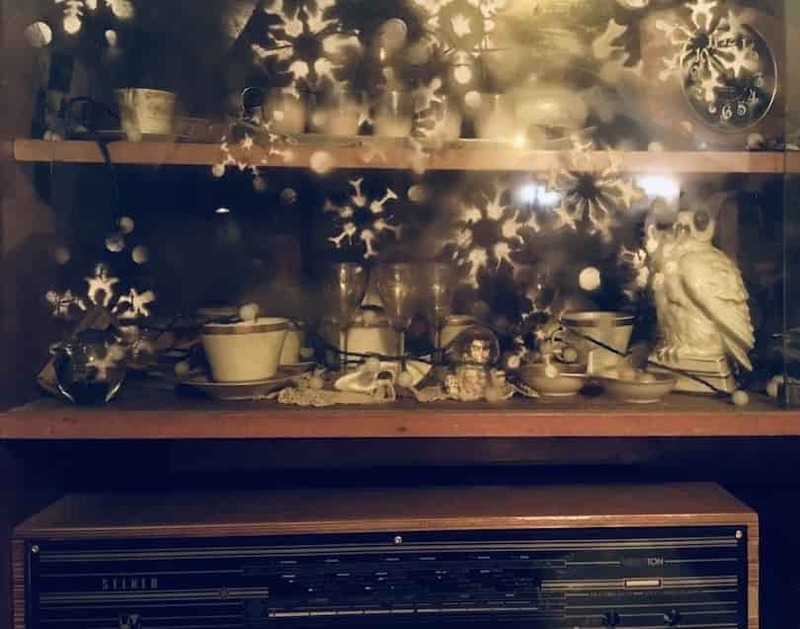 This place has a great atmosphere, lovely old-style decor, delicious Hungarian and international dishes and decently priced drinks, any time of the day and even most of the night. Fecske is a place where you can easily forget time for a little while, and just linger a bit. Budapest Bägel – For a quick but super tasty bite drop into Budapest Bägel right next door and spoil yourself, as these bagels are a godsend. They have a huge variety on offer, lots of vegetarian options, and the ingredients are fresh and crisp. Istanbul Kebab – If you’re after a quick and easy bite, Istanbul Kebab right on Kálvin Square has your back. Just go for their simplest option, the chicken filled gyros, and enjoy! Budapest is full of awful-quality kebab-places, but this is definitely one of the good ones. The ingredients are always fresh and the sauces are really good. Another big plus: it’s open until 2am. This place definitely won’t leave you hanging, even in the middle of the night. 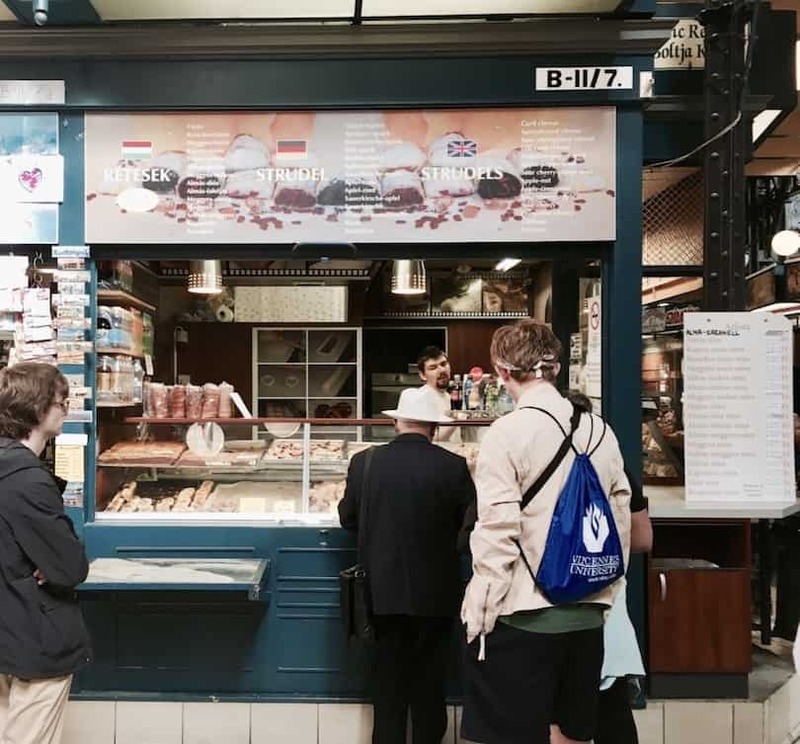 The Rétes Stand at the Market Hall – For a delicious Hungarian dessert, however, we strongly recommend the market hall – just stay on the ground floor and don’t go up to the restaurants on the first. And indulge in a rétes (Hungarian Strudel) at the famous rétes stand right in the centre alley. That’s where the locals join the tourists to share in humanity’s common love for food. The rétes come with so many great fillings that it’s hard to say which one is best. And we don’t want to influence you, so suffice to say, if you want something really special try the káposztás (cabbage) one. 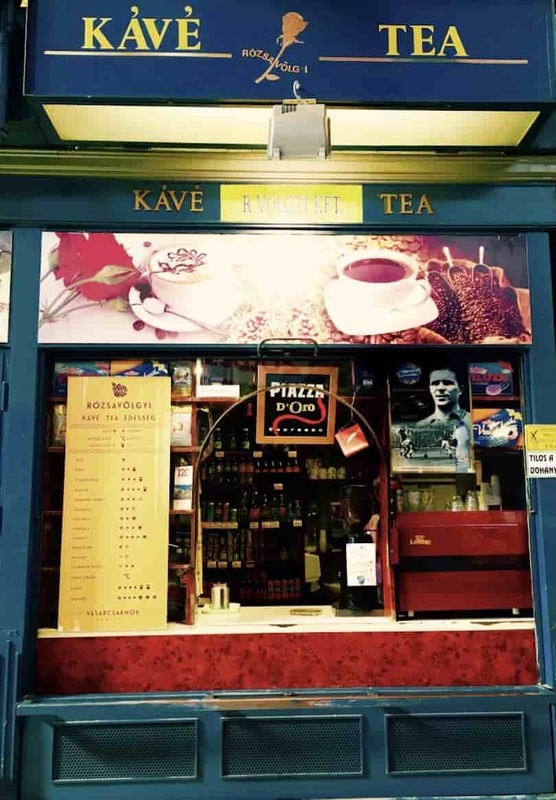 The Coffee Stand at the Market Hall – You’ll find the best coffee to have with your rétes at Rózsavölgyi, just round the corner at a very little stand. For only 160 HUF you’ll get a quality shot of caffeine that is as retro as it gets. Our tip: Try “Öcsi Plusz” – it’s not on the coffee-menu but the nice ladies behind the stand will know. Try “Öcsi Plusz” – it’s not on the coffee-menu but the nice ladies behind the stand will know. Levendula – If you’re there in spring or summer and crave an ice cream, you absolutely have to try Levendula’s crafty delicacies. Forget chocolate and vanilla and try lavender, basil and even goat cheese ice! Sound weird? Trust us, they’re all delicious and super refreshing. ‘Cserpess be’ – ‘Cserpess be’ is a bakery and coffee shop run by Cserpes dairy, a Hungarian brand offering all kinds of dairy products and pastries. Come here to try your most delicious yoghurt ever. Or go for one of the sandwiches, a sweet pastry, and wash it down with their delicious specialty coffee. An ideal place to have breakfast! While the Great Market Hall is definitely a no-brainer when it comes to shopping in the area, there are a few more rather interesting places we’d like to tell you about. Ázsia Shop – The first shop to recommend is Ázsia Shop, which previously occupied almost half of the Market Hall basement but has recently moved just outside. There is nothing you won’t find here for any Asian meal. They have gazillions of sauces, oils and spices. The starting point for all of our curries, Thai or Indian. Ázsia Diszkont – And then there is the place we simply call “Ázsia Diszkont” (The Asian Discount Store) which is by no means to be confused with the Ázsia Shop above. In fact, it’s located right next to it (Vámház krt. 7). 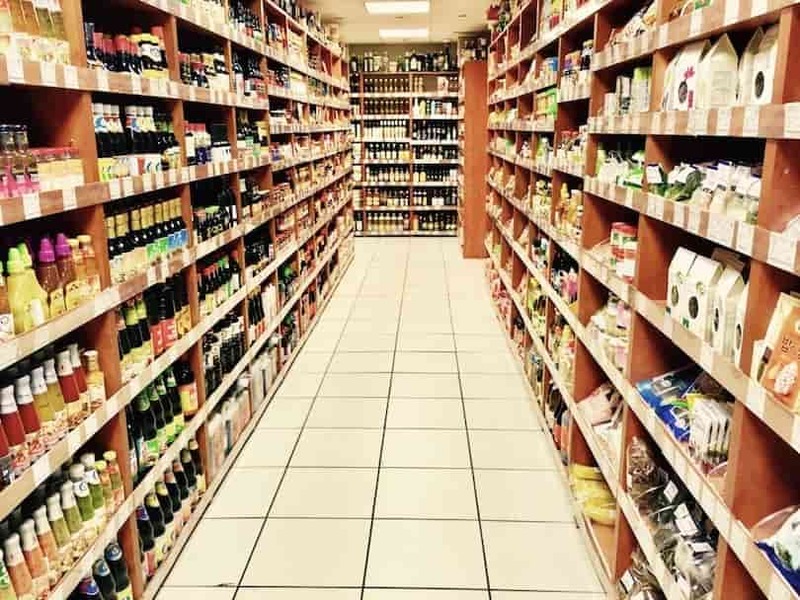 This cluttered store sells everything for roughly half the price as regular supermarkets and drugstore chains. There is nothing we haven’t yet found here in some hidden corner. Think of all kinds of sweets (from Mozart Balls to Milka), cosmetics and cleansers as examples. But this place also has light bulbs, picture frames and even clothes lines. We have no idea where the goods come from exactly, and how they make it here. And it’s probably better not to ask either. We’re just happy this place exists. 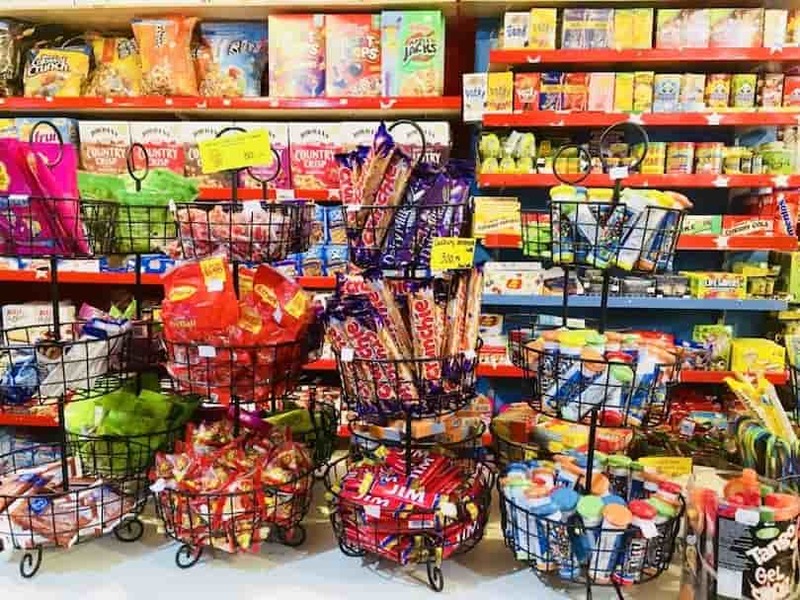 USA Candy – If you’re looking for some snacks from the other side of the globe and have a sweet tooth, you absolutely have to visit this candy shop. USA candy features chocolates, sweets and teas mainly from Britain and the US. This is where to come for Reese’s, Cadbury and – most of all – Marmite and its Australian cousin Vegemite. They have three shops in Budapest; the address of this one is Királyi Pál utca 13b. USA candy features Reese’s, Cadbury, Marmite and Vegemite too. We hope this little Budapest neighbourhood guide will help you navigate this tiny central area and its surroundings. Have fun, and don’t forget to tell your friends and share if we’ve managed to help you in any way! Next articlePost-Brexit in Hungary: Keep Calm and Carry On? Juli is the co-founder of Catch Budapest, a young and fresh city blog about life and language in the Hungarian capital. She and her boyfriend Flo share a passion for exploring the city and write about their small and big discoveries in Budapest. Together they made it their mission to show you how the city lives, works, eats and functions.